Mayo ended a 28-year wait for glory at All-Ireland minor football level with a superb victory over Tyrone in the curtain-raiser at Croke Park on Sunday. Despite struggling for long stages, Enda Gilvarry’s side had a purple patch for 15 minutes either side of half-time, when goals from corner forwards Tommy Conroy and Darragh Doherty totally changed the course of the game, and secured the Tom Markham Cup’s passage to Mayo for the first time since 1985. It is a hugely symbolic victory for the county, the first All-Ireland minor or senior final they have won at Croke Park in over a dozen attempts in the last 25 years. Tyrone were the better side for long stages but Conroy’s goal just before half-time totally lifted Mayo after a nervous first-half performance, and sent them in 1-4 to 0-6 ahead at the break. It was a superb score, the Kiltane man bustling his way around two Tyrone tackles before placing a superb shot past the despairing dive of Seán Fox and into the top right hand corner of the net. 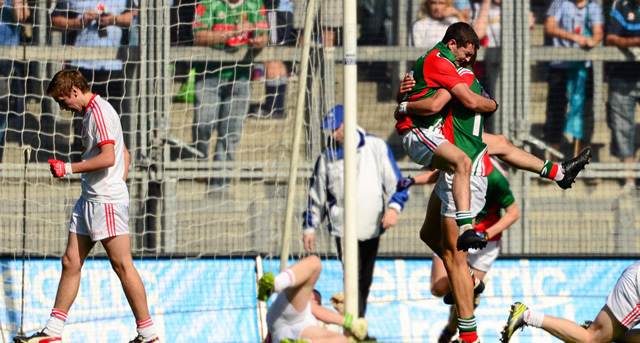 Up until that score, Mayo had offered little apart from the free-taking excellence of powerful full-forward Liam Irwin. Irwin kicked four points from frees to keep Mayo in touch against a Tyrone side that looked more comfortable going forward in the first half. Ronan Nugent (2), David Mulgrew, Ruairí McGlone and Conor McKenna all kicked points from play for Tyrone in the first half, although Mickey Donnelly’s side also kicked a lot of wides, taking the wrong option a few times too many. Nonetheless, McKenna’s controlled effort just before half-time sent them in just a point behind following Conroy’s goal. And then, in the third quarter, Mayo took over. Conor Loftus started their brilliant flurry with a superb free, and then, excellent individual scores from Doherty (2) and Conroy followed. Tyrone were stunned by the Mayo revival, and although they hit the bar with an effort that dropped over everyone before hopping and striking the woodwork, Mayo then went up and hit the killer goal. A fine move ended with Stephen Coen handpassing inside to Doherty, whose low finish to the net past Fox was coolness personified. That made it 2-8 to 0-6 with 40 minutes played, and there looked to be no way back for Tyrone. However, Mickey Donnelly’s side showed good resilience as the game edged towards the final quarter, kicking four points without reply from Lee Brennan (2), Daire Gallagher and Philip Donnelly. That left four between them, but another fine score from Loftus was a timely boost for Mayo, and left them five clear with just over 12 minutes to play. However, points from Brennan and McShane cut that again quickly, and Tyrone trailed by just three. However, just when it looked as though the Ulster side would keep clawing away at the Mayo lead, the Connacht champions kicked two crucial points to edge five clear again. Conroy pounced and fired over after a free came off the post, and then Loftus fired over his third of the game with a brilliant effort from distance from the right wing. Further points followed in the closing stages from Conor Byrne and Conroy, and the multitude of Mayo fans already in Croke Park erupted with joy as they toasted a rare All-Ireland triumph. Even a late fisted goal from Tyrone’s Conor McKenna couldn’t dampen their joy. The West’s awake.